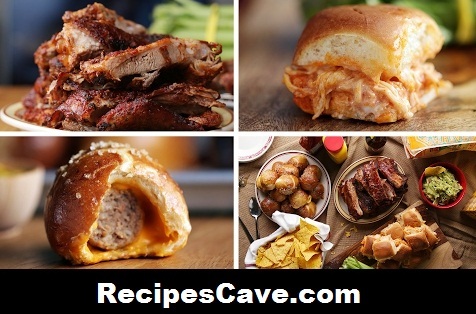 BBQ Recipe - Here you will learn recipes about bbq and bread slides. Carefully slice the pack of dinner rolls in half, being sure to keep the rolls connected as a single units as they are split into tops and bottoms. Remove the top and place the bottom section in a 9x12 baking dish. Sprinkle the bottom with about 1 cup of the shredded mozzarella cheese (make sure it is evenly coated as this will act as a barrier between the sauce and the bread, preventing the rolls from getting soggy). Top the cheese with the shredded rotisserie chicken. Drizzle the hot sauce and ranch dressing evenly over the chicken and spread out evenly with a spoon. Top with remaining mozzarella cheese. Place the top half of the rolls on top and brush evenly with melted butter. Bake in a preheated oven for 20-25 minutes, until the cheese is melty and the rolls have heated through. Remove from oven, cool slightly before transferring to a cutting board. Using a large knife, follow the lines of the rolls, cutting them into 12 individual sliders. Cut the dough into 14 evenly sized pieces. Working one at a time, stretch out a piece of dough into a long strip, about 8 inches long. Place a piece of American cheese at the top, followed by a meatball, and roll up the cheese and meatball in the dough. Rotate halfway through rolling to ensure you are completely encasing the cheese and meat into the dough. Pull tight and use any remaining slack to cover any possible gaps/holes. Press the dough into itself to seal and place on a parchment-lined baking sheet. Repeat with remaining dough, cheese, and meatballs. In a medium saucepan over high heat, bring the 5 cups of water to a boil. Once boiling, add the baking soda and stir to dissolve. Return the pot to a boil, then, in batches (about 3-5 at a time), add the rolled dough balls into the pot and allow to boil for 20-30 seconds, stirring gently. Remove and place back on a parchment-lined baking sheet. Repeat with remaining dough balls. Brush each boiled ball with beaten egg and then sprinkle each with coarse sea salt. Bake in preheated oven for 15-20 minutes, until the outsides have browned.